Well, my XBBL friends and I made the trip to Dallas for Diablo Bowl yesterday. It was a long, but fun day and we all had some real ups and downs. Jeff, who finished 2nd place at Orclahoma Bowl earlier this year had what was probably his worst tournament ever, and finished the day at the bottom table. James and Dave played their final games at tables 1 and 2, with James taking home 2nd place overall, and I only managed to finish in the middle of the pack with my 1-1-1 final record. 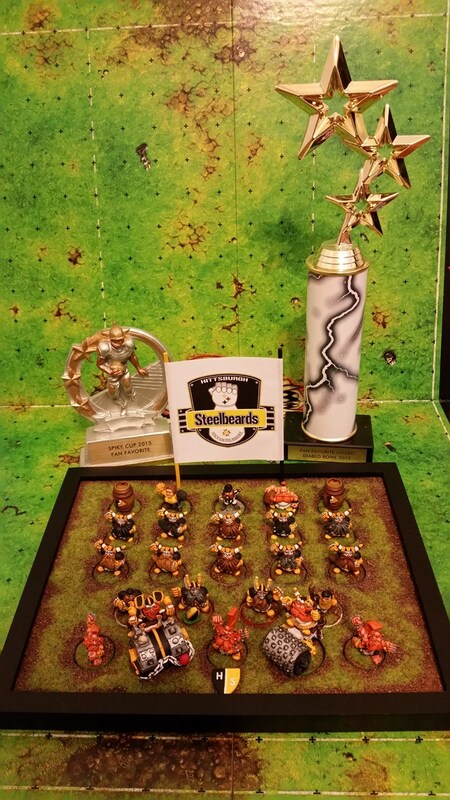 The upside is that my Hittsburgh Steelbeards Dwarf team is now a TWO-TIME award winning team. That is right! I have now taken them to two tournaments, Spiky Cup and Diablo Bowl, and have brought home the Fan Favorite trophies both times. That is a nice feeling considering how much I really hate painting minis. It was also nice to be told both times that the votes were overwhelmingly in my favor. I may not ever take home a 1st, 2nd, or 3rd place trophy, but if I can keep whipping up really nice teams, at least I can continue to bring home A trophy.